William Cronon. Nature’s Metropolis: Chicago and the Great West. W. W. Norton & Co., 1991. In this groundbreaking work, William Cronon gives us an environmental perspective on the history of nineteenth-century America. 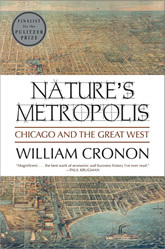 By exploring the ecological and economic changes that made Chicago America’s most dynamic city and the Great West its hinterland, Mr. Cronon opens a new window onto our national past. This is the story of city and country becoming ever more tightly bound in a system so powerful that it reshaped the American landscape and transformed American culture. The world that emerged is our own.